Every home needs a well organized pantry. Even if you don’t have the luxury of a walk in pantry, you should designate and organize an area in your home to serve as the pantry. The benefits of maintaining a well stocked and neatly organized pantry are numerous. You won’t have to make as many trips to the grocery store, Target, Costco, etc. if you follow the steps we outline in this article. Keeping items inventoried and making a complete list of what you need to purchase when shopping will allow you to use coupons and buy items in bulk, saving you money. 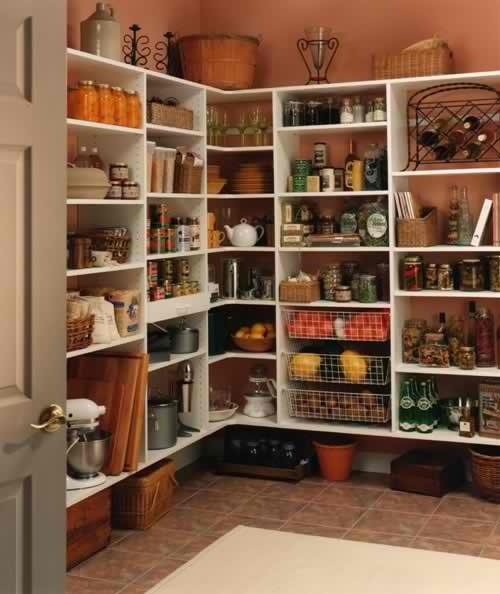 You will also maximize the available storage and shelf space in your home by keeping the pantry neat and orderly. When you need some food or other items, you won’t have to spend time searching for it or making a special trip to the store. You’ll also save on gas money this way! ·Like organizing the kitchen, a pantry should be planned to save time, energy and efficiency of motion. ·A pantry should be well-lit, with good overall ambient lighting and, if possible, task lighting that can be controlled separately to light specific areas or shelves in your pantry. ·Buy or build standardized shelving to make best use of your available pantry space. ·The most efficient pantry will be located centrally, in the kitchen or a hall closet that is readily accessible. If needed, create multiple pantry areas, organizing each space so that the items needed in the kitchen are in the kitchen, cleaning supplies, bedding and bath linens are near your home’s bedrooms and bathrooms and so on. ·Be sure to consider the humidity and temperature of your pantry; you don’t want to store dry food items in a damp place and a pantry that has a relatively cool, constant temperature is ideal. ·If space is limited, buy plastic storage containers that you can stack under a bed, in a coat closet or on top shelves. Keep items that you access less often in these storage areas. Buy in bulk to save money and keep the excess inventory in these less easily accessed areas, restocking a smaller supply in your most convenient pantry storage area. ·If you keep a good inventory of the items you use regularly, you will be better able to avoid tempting sale prices on items you don’t use and which may use valuable pantry storage space and only need to be thrown out eventually! So how do I get started Cleaning Out My Pantry? 1. Empty your pantry completely, moving everything into boxes or onto countertops. Discard or recycle anything you find which is spoiled, expired or otherwise stale or unusable. 2. Before you set about to put things in order, the first step is disassembling whatever food cupboards you currently have in use. Look at everything as you take it out and consider: how long has it been since you used that item? Herbs, for example, loose a great deal of flavor after 6 months even in a dark, cool space. 3. While you’re at it check expiration date and throw away accordingly. Remember the rule with food is when in doubt, throw it out! 4. Clean any dust or dirt off of each item as you go. 5. If something isn’t labeled and you know for certain what it is, make a hand made label for easy recognition and attach it. 6. The best part about this process is that it won’t take much more than an hour to complete this task. In fact, it’s good to do this twice a year with spring and fall cleaning. 7. Clean the shelving and walls thoroughly with a solution of warm water and mild soap, drying them with a towel and letting the shelf surfaces dry thoroughly. 1. If you don’t have adequate shelving or need to replace and standardize the existing shelves, now is the time! You can easily build your own or buy inexpensive plastic or melamine shelves at your local home improvement center and install them yourself. 2. Try to add shelving that maximizes use of vertical space. The chrome metal shelves made by companies such as ClosetMaid and Rubbermaid are a great way to add shelf space inexpensively without need to build or install anything! 3. Look for any available space you can use to store items; the back of the pantry door can be used to store spices or other small items if you hang a rack over the door! You can buy these door racks at Home Depot, Lowes, Target or a similar retail store. 4. If needed, repaint your pantry walls and shelves; white or off-white is generally the best color for a pantry. 5. If you want, put down some easily wiped-off contact paper at this juncture before re-assembling your pantry. This protects the shelf surface from stains. 6. Install your new pantry shelving and add hooks or wall-mounted wire organizers to keep canned goods and spices more neatly organized. 7. Get some of those sturdy plastic containers with tight fitting lids; Tupperware’s Modular Mates containers are great for keeping dry goods such as flour, sugar, pasta, teabags, coffee beans, and cereal. Rectangular or square containers will take up less space and stack more neatly than round or oval shaped containers. 1. Start sorting pantry items into categories. Example categories include: fruits, vegetables, soup, condiments, boxed lunches/dinners, canned meats, sauces, baking goods, and rice/pasta/dry beans. While you‚re doing this, put the items in order by their expiration dates, the soonest expiring being the last item to go back into the pantry (i.e. it will be in front, thereby reducing wastefulness). 2. The heaviest items should go on lower shelves, especially in lazy Susan set ups for added convenience. So if you have a large can of olive oil, put that on the lower shelf with the canisters for your baking goods. Meanwhile leave upper shelves for those items you access frequently (like instant foods), and lighter weight items like beans and rice. 3. Use canisters to keep dry goods and baking items such as flour and sugar, labeling them. You can keep smaller items, such as tea and coffee, dried fruits and bouillon in small baskets or plastic bins, which also helps keep them fresh. 4. Group like items together: breakfast items, snacks, baking goods, cleaning supplies, linens, etc. If you take a bit of time to consider how things are arranged in the grocery store where you typically shop, you can group your pantry items similarly, using subgroups to keep things more neatly stored and easily accessible. So, for instance, all canned foods go on one shelf, organized into subgroups such as canned fruits and vegetables, soups, crackers and cookies, etc. 5. Labeling shelves will help you keep your groups in order. Once you have cleaned out your pantry, discarded outdated items, added shelving and other storage systems, you will want to take inventory in order to determine what is missing and needs to be regularly re-supplied. Now that I have my pantry organized how do I keep it that way? ·Don’t buy things that won’t get used; every home and family will have items that are unique to their habits and personal preferences, so buy only according your tastes, budget and needs. ·Look for coupons and sale on items you keep in your pantry and use regularly, checking your inventory to be sure you don’t overstock items just because they are on sale. ·Some items, such as paper towels, napkins, etc. that will not expire or become stale you can buy in larger quantities. ·Try to buy reserve quantities of the staple items you use the most to avoid “stock outs”. Having an extra jar of mayo or some reserve cans of tuna fish on hand can come in handy. Be sure to add these items to your shopping list when you break into your reserves. ·If you have kids in the house, you might consider making a special area to keep quick snacks and treats handy so they don’t rifle through your pantry and leave everything in a mess! ·Try to reorganize your pantry when you are alone and have a block of time available to concentrate and complete the project quickly. If you take time to reorganize a couple times a year it won’t be such a big chore! ·Remember to store cleaning products and chemicals away from your food items. ·Try to keep items you use most often in front and readily visible. Stack cans, jars and other items so that the labels can be easily read. ·Be on the lookout for new organization aids such as baskets, adjustable racks, stacking containers, etc. that may improve your pantry organization. ·Set up a guest or refreshments shelf to keep crackers, dips, chips, drink mixes and other items handy so you are ready whenever you have an impromptu party or visitors. ·Keep paper and pencil or a small whiteboard in your pantry and encourage family members to record items they would like to add to the inventory or have noticed are out of stock. ·Don’t put heavy items on hard to reach higher shelves as this can pose a safety issue; keep heavy items on the floor or lower shelves. Keep a step stool or small ladder handy to reach higher shelves and be sure it has a handle and is sturdy to prevent falling! ·If you can’t get everything into the pantry neatly, you might store non-essential items in a more “remote” storage location such as the garage or basement.